The purpose of the Land Mobile Handbook is to assist in the decision-making process involving planning, engineering and deployment of land mobile systems, especially in the developing countries. It should also provide adequate information to assist in training engineers and planners in regulating, planning, engineering and deployment aspects of these systems. 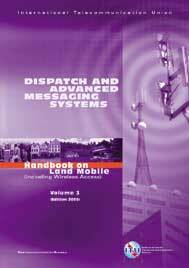 Volume 3 on Dispatch and Advanced Messaging Systems provides information on state-of-the-art technology in terrestrial land mobile paging and advanced messaging and dispatch as well as descriptions of typical systems. The technical content is intended for use by administrations and operators in both developing and developed countries.